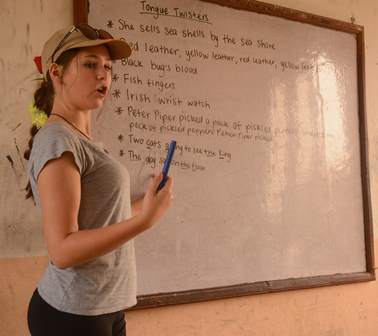 In 2015, the Orange Daybreak Rotary Club piloted a program to offer year 12 graduates an experience of service as an alternative to the traditional schoolies, often of over-indulgence. Through a competitive selection process 15 candidates were selected. 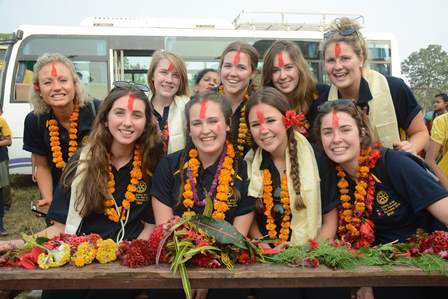 The Rotary Club provided three Rotarians as leaders with one older youth as a sort of ‘older sister’, and all the team undertook team building, fundraising and service projects during the 11 months leading to the experience in Nepal. The wind had teeth up here. It whistled around the tiny figures darting around after the tattered soccer ball. It ruffled the impossibly thin wind cheater of our tour guide in front of me. It bit through my leggings, which were near threadbare from the past three weeks of hand scrubbing them in a dry sack with cold water and a bar of soap because the detergent was running low and might be necessary if any members of the group suddenly got infected by fleas (the likelihood of the scenario is higher than you might expect). It wasn’t only the wind, however, that had set me on edge. The air was charged with something else – something raw, something organic, something I couldn’t put my finger on. I was not to know when I first clapped eyes on the place, but this was to be the sight of my greatest catharsis in my nineteen years of life.